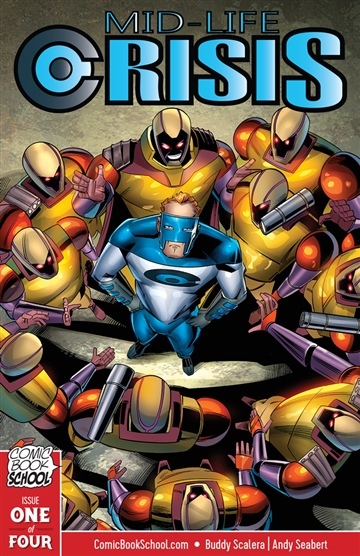 Issue #2 of Mid-Life Crisis, the story of Crisis, a superhero dealing with his own personal midlife crisis. 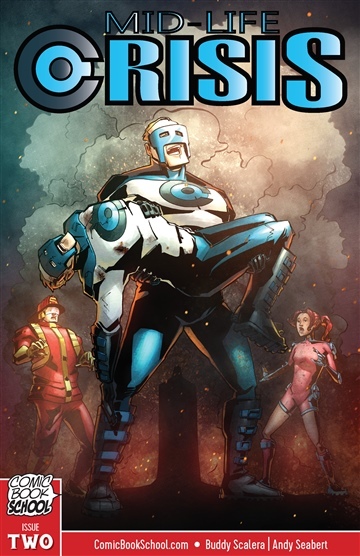 In this issue, Crisis discovers how vulnerable he is, despite having bulletproof skin. Buddy Scalera is a comic book writer, editor and photographer. He is the author of the popular Comic Artist’s Photo Reference book series for IMPACT Books, and he is also known for his best-selling series of photography CD-ROMs, Visual Reference for Comic Artists. His book “Creating Comics from Start to Finish,” an educational book that details the complete continuum of comic book publishing. It includes detailed interviews and features about top comic creators who produce mainstream comic titles. Buddy has written for many mainstream comics, including Marvel Comics’ Deadpool, Agent X and X-Men Unlimited, and he also contributed to Marvel’s all-ages series Lockjaw and The Pet Avengers. On the indie side, he has written many comics including Richie Rich, Elvira, and Comiculture. Buddy’s written over 100 articles on the topic of comics for Wizard, Comics Buyer’s Guide and Spin Online, among others, and he was the creator and editor of Wizard Entertainment’s WizardWorld and WizardSchool websites. As a comic book educator, Buddy has hosted and organized workshops and panels at major conventions in locations including New York City, New Jersey, Chicago, Long Beach, and Philadelphia.